This summer each of my grandsons wanted to spend time on the driving range with me learning the golf swing. That was great fun. Even though I’m not a professional golf coach and only an average golfer, my coaching at the range made a huge difference in their performance. Each seemed to grow from the experience. Me: I noticed right from the start that you had too many moving parts. GS: What does that mean? Me: Your feet were shifting. Your knees were moving too wide. Your arms were flopping all over the place. GS: So, what should I do about it? Me: Well, let’s start with your feet. We’ll get those stable first then work on the rest. GS: Great, can we go back out now and test it? Me: No, we’ll be having supper soon. Maybe we can try it again over the weekend. Me: (After about the third swing). Try keeping your feet still. GS: (New swing with still feet but same result). That didn’t help! Me: But it was a much better swing. Try it again. Me: Now that you’ve got your feet still, try twisting your waist instead of swaying. GS: (He hits a few balls that now go straighter and longer). Man, this is great! Which approach worked better? It’s obvious. The second approach is much more effective than the first. And, it didn’t make any difference of the skill level between grandsons. The individual instruction may have been different but the process was the same. How are you developing your people? Are you saving your notes and observations for your formal 1-on-1 review time? You: Back in March, you made a statement that shut down Carla. That prevented you from accomplishing your goal. Them: What was my statement and how did you know Carla reacted? You: Your statement was something about lack of planning and I could just tell that Carla took it personally. Them: So, what should I do about it? You: Well, let’s start with your ability to read reactions then we’ll move on to the next steps. Them: Great, can we work on it now? Me: Maybe we can try it again at our next meeting in a couple of weeks. You: When you made that statement about lack of planning, Carla took it personally and shut down. Them: Wow, I didn’t notice that. What did you see? You: First she crossed her arms. Then she pulled some papers from her briefcase and began working on them. She never re-engaged in your discussion. Them: What should I have done differently? You: Keep eye contact with people in the room. If you’re losing the focus of Carla or others, you’ve probably made a statement they don’t agree with. Express the fact that you may have misinterpreted some results and ask that everyone share their beliefs and assumptions about what happened. Them: We have another meeting tomorrow. Would you help me notice if I’ve lost people so I can try this process? 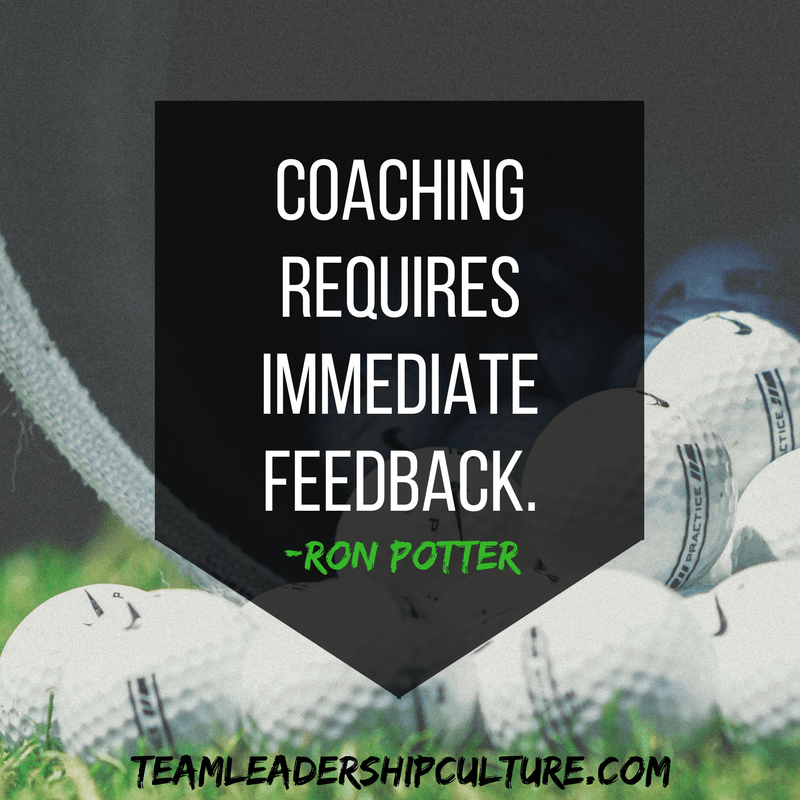 Coaching requires immediate feedback. Don’t wait for your 1-on-1 meetings. Take the time (it takes both time and courage) to develop your people in the moment. You’ll get better results and they’ll appreciate the time and courage it took to care for them.